Origin and Habitat: Korea, Northeast China and parts of Russia. Reports of this species in Southern Japan (Tsushima and Kiushiu islands) are now believed to be in error according to the International Union for Conservation of Nature and Natural Resources [IUCN]. Found primarily in mixed coniferous/broad-leaf forests; it often occurs in other habitats including open meadows, river valleys, swampy bushlands, etc. Water is always present as lakes, ponds, swamps, streams, springs, ditches, or puddles. They hibernate in the natural habitat from late September to late April/May. This toad requires its own enclosure; it will not manage in a standard aquarium of water with fish. Small fish will be eaten, or the attempt will be made. 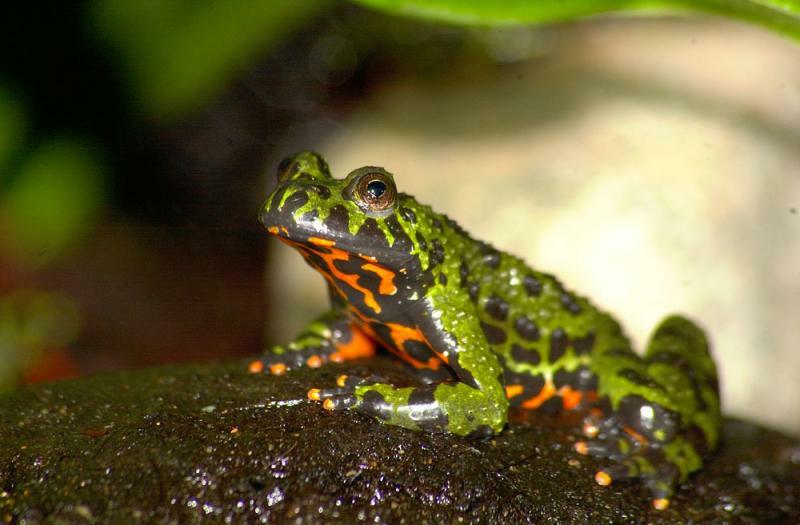 An ambhibian setup can house a small group of this toad, and other amphibians such as newts may be included. Ambhibian tanks should be stocked at the same time with all intended animals. Once established, new amphibians should not be added. The natural diet consists of terrestrial invertebrates such as worms, molluscs, and insects; prey must move to be noticed and captured. In captivity, feed live insects such as crickets (small enough to be handled), ants, flies, mealworms and small earthworms. Prepared foods such as frozen bloodworms and squid (both completely thawed) will be taken if motion is involved, such as by using a small stick to shift the food. The writer (Byron) easily trained one of these toads to eat such foods from his finger. Attains 3.5 to 5 cm/1.3 to 2 inches according to most sources. A 24-inch aquarium, such as a 15 or 20 gallon, will provide sufficient space for one or a small group. See details of the aquascape below. Hardness and pH are not significant. Water temperature should be around 25C/77-78F. 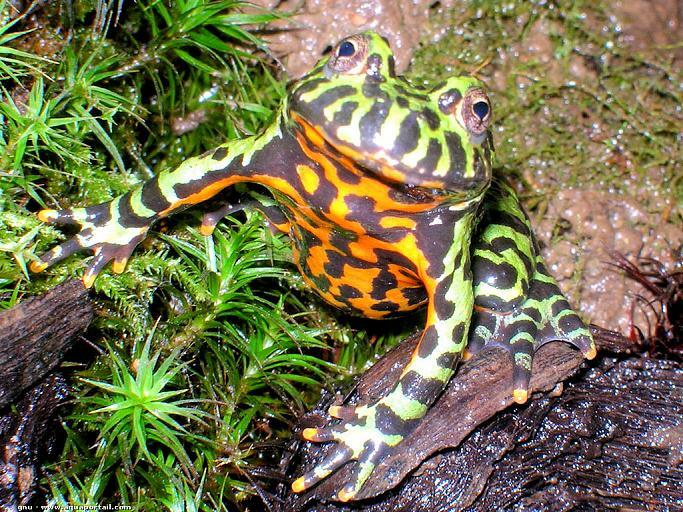 This is an ideal amphibian for captivity, being very easy to care for, plus it is colourful and will interact somewhat with its keeper. Toads are generally thought of as amphibians that have a dry, warty skin and are more terrestrial than frogs. 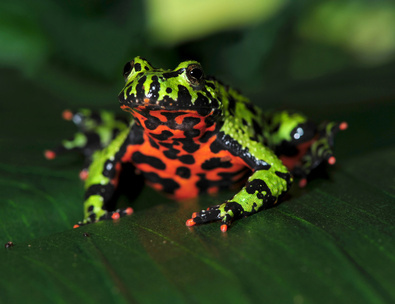 The Bombina toads are the exception; their more aquatic lifestyle means that they are more like frogs than true toads. A plaudarium-type enclosure is best, with approximately a 1/3 water and 2/3 "land" area. This toad will spend considerable time out of the water; while it does not do much active swimming, it does need to be able to submerse itself completely and move about in water. The "land" area can be formed of non-rough rock and wood, or be raised gravel separated by a partition. Light should not be overly-bright; a fluorescent tube sufficient to grow plants is adequate. Java Fern and moss are ideal. The common name refers to the vividly-coloured underside. If confronted by a predator, the toad will arch its head back to expose the red underside as a warning of its toxicity; this is termed the unkenreflex, from the German unke [= toad]. When alarmed or under threat, this amphibian can excrete a toxin through its skin that is very irritating. Hands should be well washed after handling the toad or working in the enclosure. Females are generally larger than males. During the breeding season, males develop nuptial pads on their first and second fingers, have more tuberculate skin, and have thicker forearms. Most agree on a lifespan of up to 20 years. The Bombinatoridae family, one of several in the order Anura [Frogs and Toads], holds two genera of warty, aquatic toads, Bombina and Barbourula. 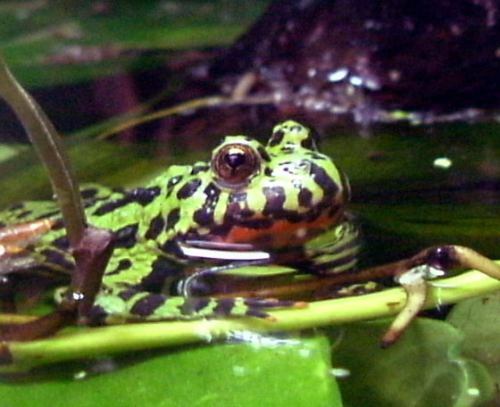 The genus Bombina, erected in 1816 by the German naturalist Lorenz Oden (1779-1851), holds eight species. Four of these, Bombina bombina, B. variegata, B. maxima and B. orientalis may be seen in the hobby, but by far the most common is the latter. Fossil Bombina are known from the Pliocene epoch (2.5 to 5.3 million years ago) through the Pleistocene (11,700 to 2.5 million years ago). The species was described in 1890 by the Belgian-British zoologist George Albert Boulenger.